Déménagement en provenance/direction de Seguin TX 78155? Obtenez GRATUITEMENT des estimations de tarif pour la location de camion au McKinney's Surplus Store. Les camions de location U-Haul sont spécifiquement conçus pour déménager des familles et non pour transporter des marchandises. Nos camions de déménagement possèdent plus de particularités de sécurité que tous les autres camions de déménagement de l'industrie, incluant une suspension pour un roulement en douceur et des rétroviseurs offrant une grande visibilité afin d'aider le conducteur. Que vous déménagiez d'un petit appartement ou d'une grande maison, le service de location de camions U-Haul à Seguin, TX vous offrira la location de camion de déménagement dont vous avez besoin pour vous rendre du point A au point B. Trouvez le camion de déménagement de la taille parfaite pour vous aider à déménager chez U-Haul, qui offre la location de camion à 19,95 $! Cliquez sur chacun des camions de déménagement ci-dessous pour connaître les caractéristiques techniques de chacun d'eux, comme les particularités de sécurité, la capacité de remorquage, la consommation de carburant et bien sûr, l'espace disponible selon les dimensions du camion. Chaque camion de location est offert à un prix unique pour vous aider à économiser de l’argent, du temps et de l’énergie pour votre déménagement à destination ou au départ de Seguin, TX. Les fourgonnettes et camionnettes de location U-Haul de Seguin, TX sont idéales pour les projets d'amélioration domiciliaire, les livraisons et d'autres petits chargements. Louez une fourgonnette ou une camionnette pour économiser lors d'un déménagement ou de livraisons de courte distance. La location de fourgonnettes et de camionnettes est très populaire auprès des entreprises locales et des étudiants, comme pour les petits déménagements résidentiels à Seguin TX 78155. Nos fourgonnettes de déménagement en location sont équipées de la climatisation, de barres de protection pour protéger vos biens et d'une attache pour remorque de location. U-Haul offre des fourgonnettes de location à 19,95 $ à Seguin, TX; réservez une fourgonnette pour votre déménagement chez McKinney's Surplus Store! I filled up the tank to exactly the amount of gas on the receipt. The needle was touching the 1/2 tank line. I've been fucked by this before, so I overfilled past the point to prevent this from happening, and they still charged me $20 for EZ Gas. Seriously, this is fucked up. The billing system is not ok. I was overcharged and they would not refund me all that I was overcharged. This is dishonest, but I guess it is the way that they make their money. I will not use U-Haul again. Mr McKinney was very nice and tried to be helpful. It appeared that he didn't have good knowledge how the system worked to rent us a trailer (that I reserved online). He had to call someone to walk him through the process and it was still not put into the system correctly. We were renting a trailer from him to use and return near our home in Justin, Tx. We made this clear when we were there. 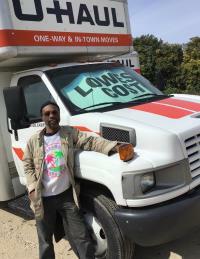 He input the trailer for a local use to be returned to his location. He then charged us an upcharge of over $30 because we were returning it elsewhere. Ridiculous! Anyway, we returned the trailer in Justin, TX (early) and then received nasty phone calls from Corporate saying we should have returned it to where we rented it. Wow. You mischarged me, wrote the contract incorrectly, and then chewed on me for my "error". Even though we have been longtime customers through the years with UHaul, I think Penske sounds like a better choice next time. They were awesome again for this returning customer. The staff was very nice and helpful. I will tell everyone this is the place to go to represent the company of uhaul. It was a flawless move. Thank you so much. Gentleman that helped me was very kind, however the process was very slow. He was unable to quickly move thru the process and was asking for more information than is usually needed. A name and number of some one not with me for some sort of verification of my identiy. I was moved to his location due to error in pick up at another location., I will not be using either again. THIS LOCATION IS NOT ON WEBSITE AND NEEDS TO BE!!!!! I still have no receipt or notice of how much the rental cost me. I have to go there again today. Start with having the right address and a store that isn't out of business. Attendant was at the location we were directed to drop off the tow dolly by chance since they had moved to a new location. Apparently the new location info had not been updated in the computer. The customers were there to rent a tow dolly, but there were not any in inventory at that location event though they had reserved one for pickup at the location. The attendant was on the phone trying to locate one when we pulled into the lot to return ours a day early. The other customer helped me unload and I helped him get set up with the dolly we had returned. One nylon strap was frayed and worn at the end of our trip. It did not break, but may need replacement soon. I was well satisfied with the rental of the trailer and the man who rented it to me was very knowledgeable. Very nice gentleman helped me. I had to go to 4 locations, 20 miles from home to drop off the trailer. The first was a vacant lot (address given to me by your traffic dept); the second would not accept trailers; the third was closed because it's Tuesday; the 4th I had to uh unhook the trailer myself because the guy's back was hurting. Terrible. Not a self-standing U Haul location - location was a Army Surplus Store. Listed return location was not close to our activities. Not your fault, but my internet sucked in Seguin, TX so I couldn't check other available locations. Maybe list multiple return locations on receipt? Mr. Michael McKinney is a super fine fellow. I believe in time he will rise to the occasion as a good U-Haul supplier. His limited space, office equipment, and inexperience, at this time, are the only reasons I have for not giving him a much better rating.